Steven was born into a family of Nicaraguan immigrants who came to the United States in search of the American Dream. Steven gets his motivation to be successful from his parents who have taught him that anything is possible as long as he remains determined and works hard for it. As a senior at iPrepartory Academy, Steven has excelled in all of his college-level classes through his dual enrollment program at Miami Dade College, ranging from calculus to U.S. History to microeconomics (his personal favorite). His passion for education granted him recognition from the Harvard Alumni Association of Miami for “his love of learning for the sake of learning.” Aside from his academics, Steven is an activist for LGBTQ issues: He started his school’s first ever Gay-Straight Alliance and completed a summer internship with The Alliance for GLBTQ Youth, an LGBTQ-rights organization based in Miami. He is also involved with his school’s Key Club and Model United Nations team, among other clubs. In the fall, Steven will join the Class of 2020 at Harvard College, where he plans to study economics. Steven aspires to obtain a Ph.D. in economics and wishes to conduct his own research on the economic trends of minorities in America. Steven mentioned that the R2L NextGen program served as a springboard for his curiosity because it exposed him to the socio-political issues Latinos face today. As an advocate for the LGBTQ community, Steven believes that through his participation in the R2L NextGen program he has been taught the necessary skills to successfully communicate his message to community members. 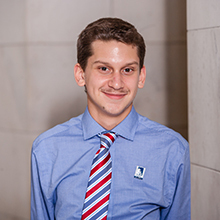 “The R2L NextGen program provided me with an opportunity to discover what happens behind the scenes in Washington, and it made me realize that a future in government is not only possible, but also attractive,” he said. CHCI congratulates Steven for his commitment to excellence and improving his community; He has a bright future ahead of him. CHCI is proud to have Steven as part of the CHCI familia! To support dynamic students like Steven Espinoza and CHCI’s programs such as R2L NextGen, please visit: www.chci.org/donate.